A new School of Business Finance Lab will bring students access to state-of-the-art technology to develop their skills as they learn about the world of finance. 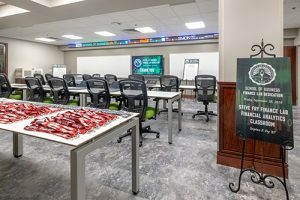 A dedication ceremony, which marked the start of 2018 Homecoming festivities, highlighted the lab’s twelve Bloomberg terminals and stock ticker – tools designed to give students hands-on experience and a competitive edge as they enter the workforce. Students will be trained using Bloomberg Market Concepts software on Bloomberg terminals, the most widely used tool of its kind in the world. Those who complete the training program will receive certification in the software, which offers a wide array of data on businesses, analytics, financial variables, corporate governance and more. With twelve terminals, the Finance Lab provides the largest degree of higher education access to Bloomberg tools in central Indiana. Dr. Larry Belcher, dean of the School of Business, describes the $300,000 lab facility as an experiential learning device to serve as a framework for curriculum-building. The focus on applied learning ties in closely with the school’s ethos. “This is a major development for the School of Business. 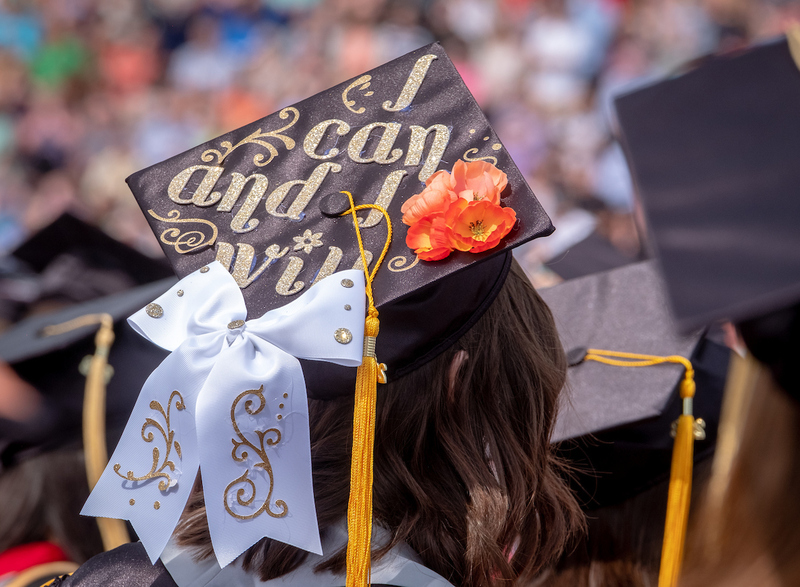 For students who want to go into finance and other disciplines, having exposure to professional-grade tools and the opportunity to be certified in their use is huge,” Belcher said. The Finance Lab acts as a contemporary “front door” to the new home of the School of Business on the first floor of Esch Hall. In addition to the Bloomberg terminals, which provide access to the software, an electronic ticker displays financial data, including the stocks in a student-managed portfolio and major market indices and news. The UIndy Student Fund is one example of the School of Business’ approach to hands-on learning. Students in the one-semester class manage about $100,000 in a brokerage account. Belcher explained that they learn to research companies and make investment recommendations based on their research. If approved by their instructor, the Schwab custodian will execute the trades. While the students don’t actually trade, Belcher said they do have a fiduciary responsibility. “You are now legally in charge of somebody else’s money. There are professional and ethical responsibilities that go along with that. They will be held accountable for the decisions they make,” Belcher explained. The facility and capacity offered by the Finance Lab will filter into a variety of areas in the School of Business curriculum, including a new graduate program in data analytics slated to begin in fall 2019. Belcher said there is also potential for interdisciplinary collaboration. “Data management is a huge thing in health care. We’re looking at opportunities to utilize the capacity in cooperative ventures with other programs, primarily in the health professions,” Belcher said. Through the Campaign for the University of Indianapolis, the generosity of more than 150 donors supported the creation of the Finance Lab. Major supporters included Stephen Fry, chair of the University Board of Trustees, who was instrumental in the project, along with Tom Martin; Joe and Kim Cathcart; John and Melissa Duffy; Jeff and Stacy Mitchell; Larry and Jane Keyler; and JP Morgan.